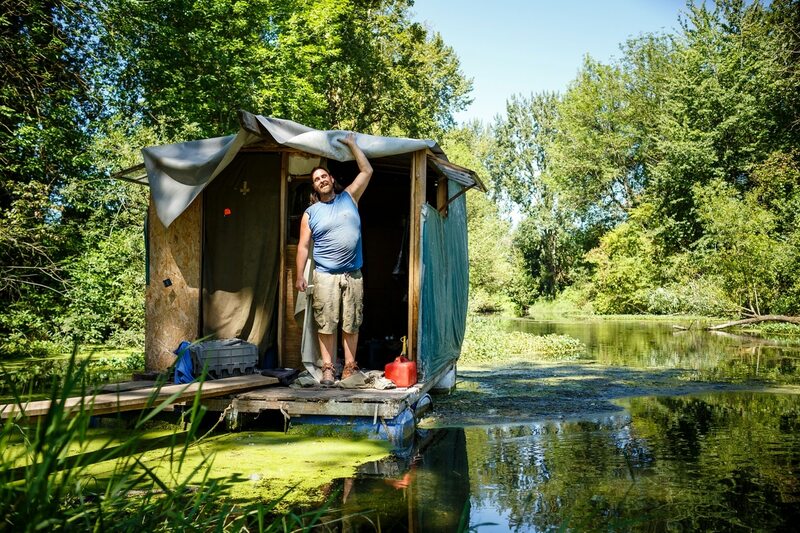 Three miles to the north of the Springwater Corridor, a bold experiment is underway. Portland Police Officer Jason Jones arrives early in the morning at Slough Town. Three hand-built wooden rafts sit atop plastic barrels moored to the water's edge in the Columbia Slough. On one raft and on the land nearby are a few camping tents. 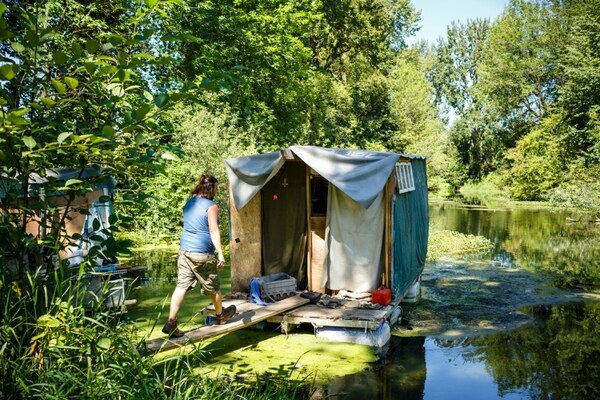 The other two rafts hold handmade tiny houses, constructed from wood pallets and plastic tarps. The captain of this flotilla goes by the name Gilligan. His real name is Danny Ferren. He's 39 years old with a meth addiction and minor brushes with the law over the past 10 years. A year ago, he picked this out-of the-way bog as a homestead. 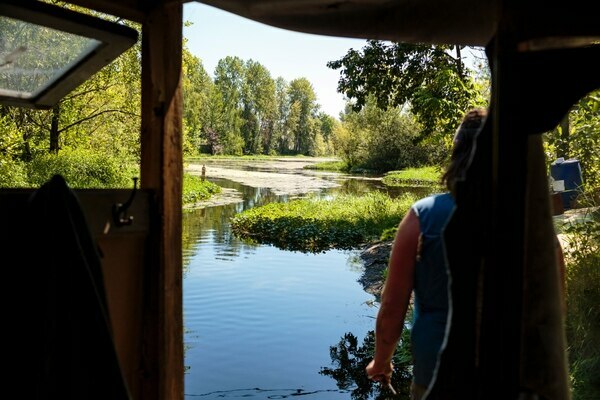 Now living in the slough—a swampy channel of water bordering the Columbia River near Portland International Airport—with a half-dozen other homeless people, Gilligan is facing a cop. Gilligan knows what usually comes next. He gets rousted—a casualty of the increasing disdain Portlanders have for a growing homeless population blamed for wrecking natural areas, attracting vermin with piles of garbage, and stealing. Yet Jones hasn't come to sweep Gilligan out. Instead, he's bringing good news: Jones says he's talked the city out of erecting a fence to block access to the slough. Gilligan sounds relieved, even though he was ready to improvise. "I was just going to build a ladder and go over the fence," Gilligan says. "That would be awesome," Jones says. "That would be creative." The friendly chat between Gilligan and the local patrolman on a July morning isn't an accident. It's just one of several experiments over the past six months in the outer Northeast Portland neighborhood of Parkrose, where community leaders are trying something different with homeless people: welcoming them. This summer, the eyes of the city are fixed on the Springwater Corridor, a bike path in outer Southeast Portland that has become home to as many as 500 people sleeping outdoors—one of the largest concentrations of homeless people in the nation. 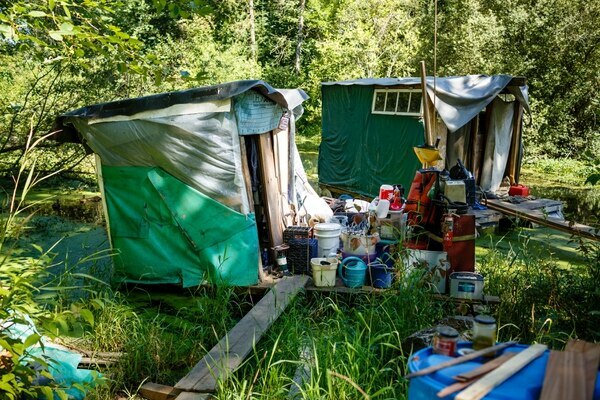 Mayor Charlie Hales pledged to clean out Springwater camps this week—but then he postponed the sweep until Sept. 1 after homeless advocates at the Oregon Law Center threatened a lawsuit. On Aug. 2, the mayor also scaled back permission to pitch tents in Portland. Related: Mayor Charlie Hales scales back his policy allowing people to sleep on the street. The Springwater cleanup is the latest flash point in decades of City Hall efforts to address homelessness. 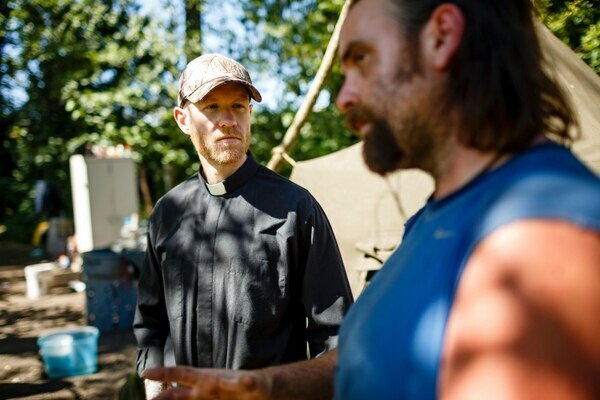 But three miles to the north of the bike trail, a cop, a priest and a former professor are trying to find a better way. It sounds like a setup to a joke. 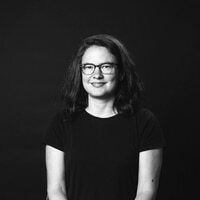 But Jones has teamed up with Mingus Mapps, who heads a business development nonprofit, and the Rev. Joshua Kingsley, a priest at St. Matthew's Episcopal Church, in an effort to rethink how neighborhoods like Parkrose treat the people sleeping on their streets. To be sure, Parkrose is hardly the only place in Portland that shows compassion to the homeless. The strategies Jones and his two partners are employing aren't unique. 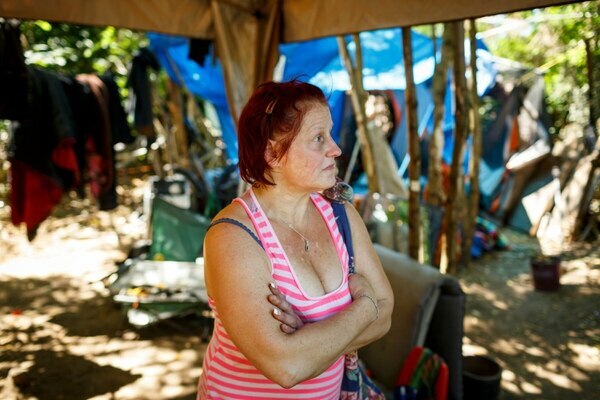 And the neighborhood isn't grappling with a problem on the scale of the Springwater Corridor—about 100 homeless people live in Parkrose, scattered among small camps, living in RVs and squatting in foreclosed homes. But what's noteworthy about "the Parkrose Alliance" is that it didn't start at City Hall, or from the city's fiercely protective homelessness activists. Instead, it quietly grew from a police officer and leaders within the neighborhood, who decided they would rather work with their homeless neighbors than against them. "My idea was, if they know I'll treat them fairly, that I'm kind, and I'm trying to help, they'll be more willing to help me and more willing to listen," Jones says. "I've found that works very well for Parkrose." Three days spent on the streets of Parkrose show the neighborhood's brain trust struggling to bring stability to chaotic camps and drug-addicted people, while trying to keep the peace with the homeowners and mom-and-pop businesses next door. It also shows that addressing the homeless crisis in Portland may not require opening Wapato Jail or building a $100 million shelter on the waterfront. This city needs far more affordable housing units, but in the meantime, management of homelessness involves far less dramatic actions: paying attention to the little details that make life on the streets easier and more orderly. Bruce Drumright, a former network engineer who lives in Gilligan's floating camp, can see the difference in how Jones treats him. "He looks me in the eye," Drumright says. "He actually sees me." Jason Jones has always been an unusual police officer. At 42, he talks like an academic and looks like an extra from Top Gun. For vacation, he travels to destinations like the Bahamas—to train local police forces. He works a second job as an adjunct college instructor, teaching criminal justice classes at Portland State University and Mt. Hood Community College. That bookish bent showed even in his first days on the Portland force, 17 years ago. 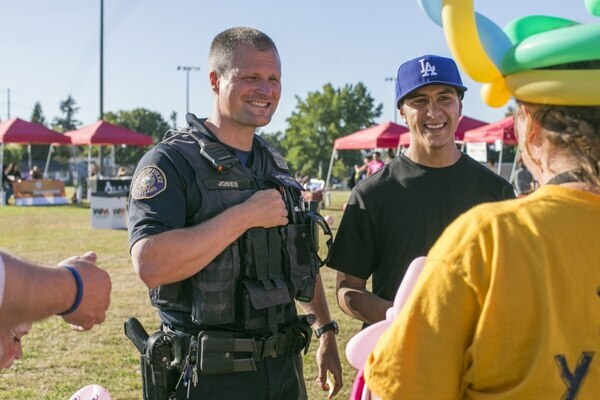 During police academy training, he spent nights at the library, finishing his master's degree in behavioral sciences from California State University, Dominguez Hills. In an introduction to his PSU course, Jones outlines his understanding of the nuances of policing homeless camps. "The unhoused know that if livability problems get too problematic, the police will be summoned to address them," Jones writes, "so there is no need to exert informal social controls over other unruly persons tied to their social groups." Parkrose has been his assignment since late 2012. He arrived to a neighborhood on the east edge of I-205, stretching north from Rocky Butte's lookouts to the parking lots of IKEA. It's a neighborhood with few landmarks—its best-known feature is probably the Multnomah County Inverness Jail. In the past five years, Parkrose has seen a spike in its homeless population. It's hard to know precisely how much homelessness has increased in Parkrose. But since 2011, calls to police about "unwanted persons"—trespassing—have spiked 287 percent from 123 calls a year to 477. The number nearly doubled from 2014 to 2015 alone. As one of only two neighborhood beat cops working Parkrose during the day, Jones faced a decision: come down hard on scofflaws or launch a campaign to make homeless people feel safe enough to talk to him. "Incremental trust-building" is how officer Jones describes his work now, noting he's gotten to know "most everybody" in the camps. Jones says he rarely makes drug arrests that aren't combined with other illegal behavior—particularly dangerous driving. During a recent day on patrol, Jones interacts with a man on the sidewalk who appeared to be overdosing but snapped out of his nod abruptly. He also visits a camp along Sandy Boulevard, where people are living behind the blackberry brambles, completely hidden from the street. A 36-year-old woman who gives her name as Vectra is barefoot, disheveled and carrying more than she can handle. She's leaving the camp when Jones arrives. He asks how she is. Her response: "Every day is good day." Jones offers her a container in which to dispose of her needles, and she accepts. 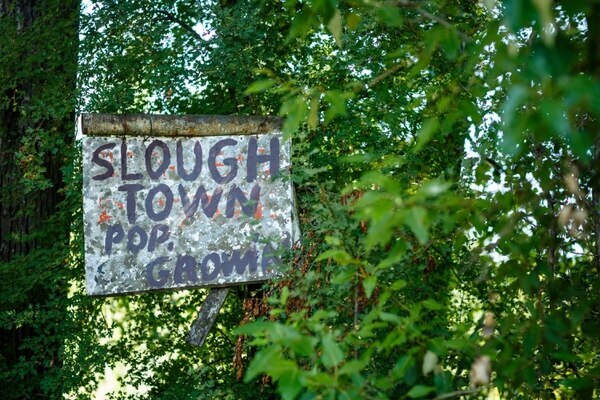 At Slough Town, Jones asks about a new visitor to Parkrose homeless camps that he's been hearing about—a young newcomer who has been causing trouble. "I've been hearing about this guy Cody?" Jones says. "He's a problem," Gilligan says. "How can I help? What are your ideas?" Jones asks. "I'm hearing from people that he's a predator, preys on the weak." "I'd like to set him on fire," Gilligan says. Another camper adds: "He's a bully." "I'm not writing a police report," Jones says. "I just need to have a conversation with him." "He had a pellet gun he was running around with—very realistic," Gilligan warns. The trust between Jones and Gilligan—the kind that breaks through the street code against snitching—has been a year in the making. Thursday is trash-collection day at the homeless camps. That's when inmates from the Inverness Jail arrive at Slough Town and other spots across Parkrose to gather garbage bags that homeless people have placed at the edge of camp. The idea for garbage pickup at homeless camps started this past winter with conversations among Jones, Kingsley and Mapps. Mapps, who sports dark-rimmed glasses and a shaved head, runs the nonprofit Historic Parkrose. His main duty is giving out matching grants funded by the Portland Development Commission so businesses can renovate their storefronts. But Mapps began thinking differently last year when Brian "Pirate Jack" Scott, 57, wandered into his storefront, looking for help from the police. Mapps shares space with Jones and other officers, who use the office mostly as a spot to eat lunch and take a restroom break. That means Mapps ends up fielding all manner of visitors. Pirate Jack—who has a long, thin, craggy face and dark, shoulder-length hair—came in one afternoon last year. He had been living along the train tracks until railroad police cleared his camp. Lost in the sweep were his aunt's ashes, Mapps recalls. That story touched Mapps. He met with Jones and Kingsley, the Episcopal priest, to talk about a new approach. They decided to do something unusual: hold a summit between homeless campers and local business owners. They held four listening sessions in February, March and April. At two meetings, the homeless told their stories; at the other two, neighbors and business owners took their turn. Annette Stanhope, head of the Parkrose Neighborhood Association, was struck by Jones' assertion that most homeless campers were trying to be law-abiding. "Just a fraction of the people out there are causing crimes," Stanhope says. "If I were to say that, it's fairly presumptuous. Because he has experience interacting with the homeless, it carries a lot more weight." 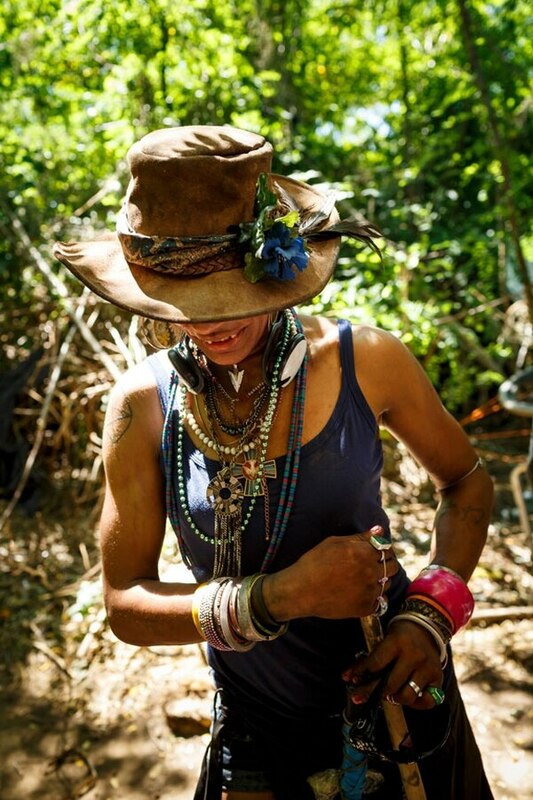 Related: Some homeless people have lived along the Springwater Corridor for a decade. One thing businesses and campers agreed on: Neither liked the piles of garbage and the rats the camp attracted. "There's trash everywhere," says Angie Jenkins, president of the Parkrose Business Association, "but it's illegal to put it in someone else's trash can. They're not going to do it, because they're going to get arrested." So the newly formed Parkrose Alliance made trash the main priority. In Parkrose, because many campers weren't on city property, installing dumpsters at all the camps proved impossible. After the listening sessions, the business association began providing trash bags. Jones delivers them to camps, and Mapps keeps 1,000 in his office on Northeast Sandy Boulevard. Jones arranged for inmates to pick up the trash on Thursdays. The arrangement is ad hoc and fails from time to time. The third week in July, the garbage wasn't picked up. Jones was on vacation, so he didn't spot it. In the meantime, businesses neighboring the camps became alarmed. But the next week, it was back on schedule. The idea of trash pickup at homeless camps isn't unheard of. Hales' office has at times provided it along the Springwater Corridor. But a neighborhood-run trash service for the homeless is an innovation. The Parkrose Alliance had more ideas. Gilligan mentioned that campers needed fire extinguishers—and businesses donated a few of those as well. Other ideas—portable toilets at camps, and getting a laundromat to accept locally made tokens—have so far fizzled. But the group now has bigger ambitions. Next month, the Parkrose Alliance plans a resource fair for the homeless, featuring help for getting identification and drug treatment. Jones even wants to create affordable housing, maybe in vacant houses now used as squats. Outside observers are impressed. "They're trailblazing models of bringing in all the players to a shared community problem," says homeless activist Vahid Brown. Even the local business association president is thrilled. "It's the entire neighborhood talking," Jenkins says. "It's huge when you collectively get together. I love it. We can take America back." On the morning of July 28, Gilligan gets another visitor to his floating camp: the local priest. Kingsley is 33 years old and wearing a baseball cap, Converse sneakers and tan jeans with his ecclesiastical white collar. He's rolled up his long black sleeves just enough to reveal tattoos, one of which bears words from the liturgy: "Kyrie Eleison, Christe Eleison, Kyrie Eleison." Gilligan offers to show him the improvements he's made since Kingsley's last visit. The camp is full of Gilligan's handiwork. There's an outhouse, a shower, a solar-powered porch light, and a miniature wood stove. Kingsley peers at the tiny stove. "I feel like I remember you doing like a lot of trial and error with that," he says. "Oh God, it was so much trial and error," Gilligan says. "One of the most beautiful sounds in the world that I have ever heard is when I finally got it right and I closed that door, and I heard this 'hooo.' It was so wonderful." Kingsley is the third member of the trio leading the Parkrose Alliance. While Jones is the street ambassador and Mapps runs logistics, Kingsley pushes for a larger vision. The experience gave him a strong political bent. "My life was hard like that, in part because my dad was paid below a living wage," Kingsley says. "In part, people made money off my life being hard. My pain and suffering subsidized their kids going to better schools." When he was a kid, he wanted to grow up and be a minister. But his first job was as a music teacher in White Salmon, Wash. His wife is still a teacher. When the recession hit, they moved to Portland, and he decided to pursue the priesthood he'd first contemplated at age 10. Two years ago, he took his first pastoral assignment, at St. Matthew's Episcopal Church on Northeast Prescott Street and 112th Avenue. Before this year, Kingsley had met some of the neighborhood homeless. His church has an outside water spigot and electric outlet that it allows the needy to use. But joining the Parkrose Alliance has given Kingsley ideas. Now he's pushing his allies to develop a grand vision for what they can accomplish in the neighborhood: making Parkrose into a hub for neighborhood-level social justice work. "What we're talking about," he says, "is trying to establish the common good in Parkrose." Six months into the experiment, not everyone agrees things are getting better in Parkrose. Dean Payne moved his business into a property on the Columbia Slough more than 10 years ago, when he says the spot was being used for drug dealing and prostitution. He still runs his construction company out of the site, and says the garbage pickups have emboldened campers on the waterway. "They do nothing but live off us," Payne says. "They leave their garbage. They get food, clothing and medical care. We have to pay for it. They do nothing but do drugs and steal, and that creates more expense for us. I think they should quit feeding them, quit clothing them, taking care of them, so they have to go to work." Related: A transient boater says he pulled a gun on a drone because it invaded his privacy. But others say the neighborhood is proving that it's possible to reach an uneasy peace with people who don't have any way to live indoors. "It's not going away," says Cathy Morris, vice president of Northwest Pest Control, a local business. "We have to address it. You can't just push people from here to there." And Gilligan? He says his life in Slough Town is going great. He says it's the result of his hard work and self-reliance. He lives on $50 a month. He refuses food stamps, because he knows he'd sell them to buy meth. Instead, he barters for his drugs with items he finds in the trash or by doing odd jobs. He works seven days a week, hauling cans and scrap metal in a long, heavy-duty trailer that fits on the back of his bike. He's voting for Donald Trump. But he also is grateful for what Jones, Mapps and Kingsley have done. They listened to what he needed, instead of telling him what to do. "That is not something that has happened out here before," Gilligan says. "They earned my respect." Gilligan now has only one nagging worry. He fears that police sweeps of the Springwater Corridor will bring more homeless to Parkrose—perhaps a worse kind of homeless. He left Johnson Creek along the Springwater trail more than a year ago, and he doesn't want what he saw there coming to him. "I think the homeless people are better out here," Gilligan says. He says the Springwater attracts "lazy" homeless people because it has places for them to get a hot meal and new clothes and exchange needles. He hopes to discourage new arrivals from ruining Parkrose—a place where living outdoors finally feels like home. "We want to nip that in the bud," Gilligan says. Kingsley takes a more welcoming view. "We want to get ready for it," the priest says.